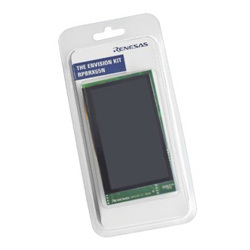 This development kit, from RS Components, is an evaluation tool for Renesas microcontrollers. The RX65N Envision Kit offers an evaluation of in-circuit programming and debugging with E2 Lite On Board. The WQVGATFT LCD panel is driven directly from the Graphic LCD Controller peripheral and features a 23V LED driver circuit for LCD backlight. Graphics manipulation is provided by the 2D Graphics Drawing Engine with capacitive touchscreen sampling via the I2C controller, and on-board QSPI serial Flash. The device offers USB 2.0 host and connection for external PmodTM based peripherals. The kit board includes all the circuitry required for microcontroller operation. A mixture of other peripherals are tracked into the kit PCB design, but not fitted as standard.